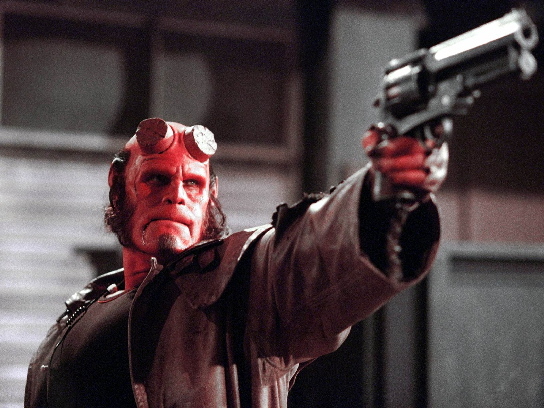 Hellboy (2004): Hellboy, in its entirety, is one of the very best movies you will ever see...period. This is unquestionably Ron Perlman's best role. He gives the character of Hellboy so much personality that he really makes you want to believe that there really is somebody like Hellboy. This movie has a pretty dark theme: fighting demons from Hell. However, there is so much comedy that you don't even think of it as being gothic. The action and special effects work is beyond compare. Plus, we not only have a great cast of actors in this film, but the cast of characters is engaging as well. You have Hellboy's human sidekick John Myers who is a regular guy and doesn't know what to make of all the craziness going on, then there is the "fish guy" Abe Sapien with his vast intelligence and goofy demeanor, Hellboy's girlfriend Liz who can make herself a human torch, Rasputin the villain, Rasputin's crazy Nazi-woman henchman, the one-time Nazi assassin who is like a human tinkertoy (if you don't know what I'm talking about, you'll find out when you see the movie), and last, but certainly not least is Hellboy's father figure Broom. Special mention goes out to John Hurt, who plays Broom. I really enjoyed him as that character and when the character got killed I was shocked. We almost knew that it had to be, because we find out near the beginning of the film that he's dying, but still we don't want him to die like he does. 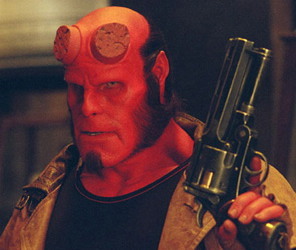 Hellboy, as played by Ron Perlman, is big, nasty, funny, and very human. He's definitely a hero, and not one of those superheroes that could pass for being a bad guy like we see so often in comics and films. I believe they can continue this film series for a very long time.